Attention, federal employees: The Trump era presents an opportunity for you to contribute to the public debate by disclosing wrongdoing. Trump’s blasts at the news media and his landing team efforts to compile information on agency political leaders mean that federal employees and whistleblowers in this era of unified Republican government are a “critical source of unimpeachable information,” the attorney said to a Sunshine Week audience of journalists, transparency advocates and agency staff. “You’re asking people to risk careers--it takes courage to inform on employers,” he acknowledged. “A person may have been there 20 years and is looking for a pension, but can see something that’s not right.” Such employees “can contribute to government making a reasonable decision, not just this sometimes unreasonable unified government’s decision,” he said. 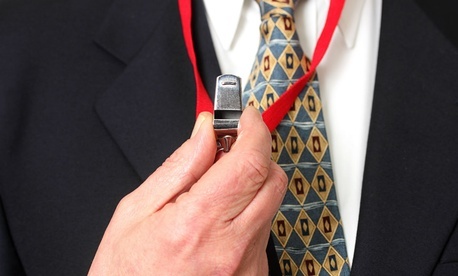 The key is knowing the legal protections for whistleblowers, Macleod-Ball added. “So many in the federal government don’t know what protections are” spread across 24 statutes. Though acknowledging that it’s early in the Trump era for passing judgments, the early signs are worrisome for transparency, panelists said. The press “may be more seriously challenged than ever before,” said John Donnelly, senior national security writer for CQ Roll Call and Chairman of the National Press Club Press Freedom Committee. He cited President Trump’s steps to ban reporters from some briefings and his complaints about anonymous sources. When Trump says that CNN, The New York Times and MSNBC “are not considered credible,” said Nancy Youssef, the senior national security correspondent for Buzzfeed News who has covered war zones, military sources tell her, “My commander-in-chief says you’re not credible, so why should I talk to you?” She also expressed concerns about Secretary of State Rex Tillerson and Joint Chiefs Chairman Gen. Joseph Dunford traveling without press pools. Pushback against the panel’s criticisms of FOIA offices came from audience member Ginger McCall, a former transparency activist now with an agency, who spoke on her own behalf. “It is dangerous to say FOIA officers should be punished,” she said. “Don’t assume malfeasance." Her experience on the inside has taught her that FOIA staff are often under-resourced and using inadequate technology to find documents and work through a large backlog, she said.